Rescue workers have found a pocket of air leading to hopes some may have survived. 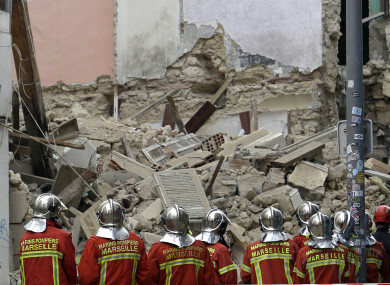 AS MANY AS eight people might have died in the southern French city of Marseille in two building collapses, officials said after the first body was pulled out from the wreckage this morning. There are between five to eight people missing, Interior Minister Christophe Castaner said late last night, with authorities trying to trace five residents and three other people who had been invited to the buildings. “The most important is saving lives,” Castaner added from the scene. During the first clearing operations we’ve found some pockets of air that means we still have some hope of finding and identifying a survivor. The first victim – a man – was pulled from the wreckage Tuesday, prosecutor Xavier Tarabeux said, adding that he needed to be identified. Email “'The most important is saving lives': Up to eight feared dead in Marseille building collapse”. Feedback on “'The most important is saving lives': Up to eight feared dead in Marseille building collapse”.